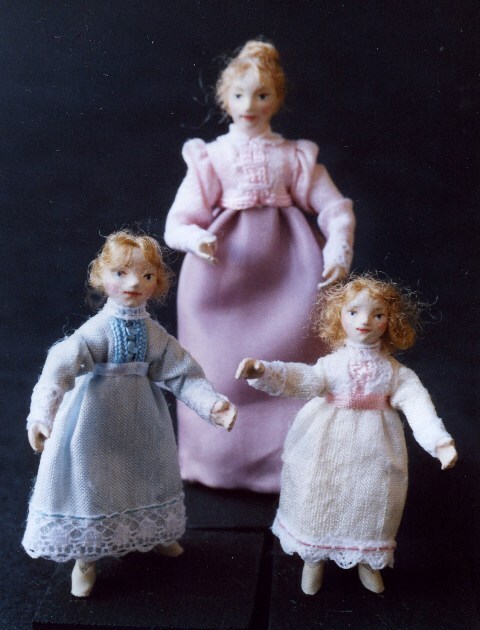 I grew up surrounded by miniatures made by my mother, Jill Bennett. I have always loved making and designing clothes and after my marriage decided to stop working as a theatrical agent and embarked on a dressmaking and pattern-cutting course. I made clothes to order, specialising in women's tailoring, until the birth of my son and our move out of London. It became impossible to have large amounts of beautiful fabric in the house, especially after my daughter was born, so I scaled down and started dressing dolls for mum. She encouraged me to think about my own business and after a trip to Miniatura I became very excited about the 1/24th scale. The dolls are cast in pewter with twisted steel joints, so that they are fully poseable and robust. They have painted faces and hands, shoes and hair. 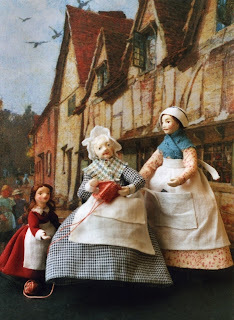 I enjoy making all periods and will happily make any doll to order. I use a variety of materials and am surprised at how adaptable the scale is. I try to make real people, capable of having a story all of their own, who look as if they live in their clothes. I now have a small range of accessories - cats, babies and some baskets - and hope to develop more in the future. I love the 1/24th scale - it has a special charm all of its own.